Observed at Eldoret Kenya. Dec. 2015. Host is Ficus benjamina, a cultivated fig species. From Wikipedia: Diaspididae is the largest family of scale insects with over 2650 described species in around 400 genera. 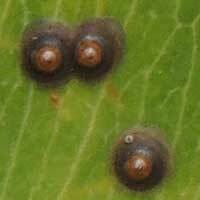 As with all scale insects, the female produces a waxy protective scale beneath which it feeds on its host plant. Diaspidid scales are far more substantial than those of most other families, incorporating the exuviae from the first two nymphal instars and sometimes faecal matter and fragments of the host plant. These can be complex and extremely waterproof structures rather resembling a suit of armor. 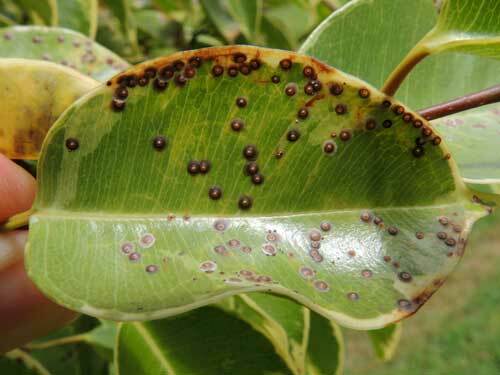 For this reason these insects are commonly referred to as armored scale insects. As it is so robust and firmly attached to the host plant, the scale often persists long after the insect has died.